The WEC, with numerous educational brochures on composting and recycling, invasive species, green infrastructure, eco-gardening, food recovery, pollinator conservation, and other environmental issues. Much of the literature is kid-friendly—intended to help youngsters learn “best practices” in caring for Mother Earth. 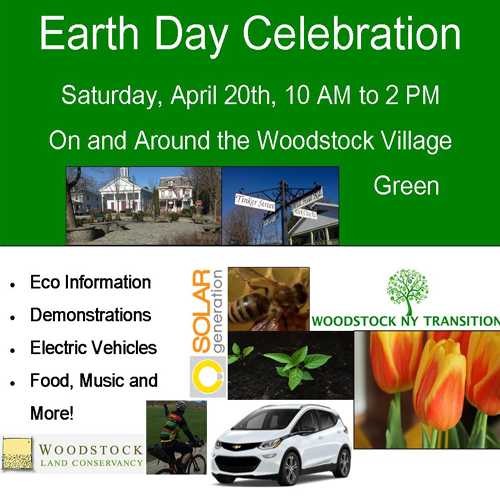 Please join us for a fun and informative celebration. The WEC would like to give special thanks to sponsors H. Houst & Son, Jarita’s Florist, the Woodstock Reformed Church, Clouds Gallery, Grace Hats, Tinker Toys Too! and Woodstock Blues.